I began raking today. We live on an acre, about a quarter which is wooded. An eighth is the house. An eighth is the garden. So it’s really only half an acre to rake. I like raking. “Nobody likes raking.” That’s what my husband just said reading over my shoulder. BAHHAhhahaa I really do! It’s an instant gratification thing. When you begin the ground is a brown and orange textured carpet. Immediately stripes of green appear and suddenly I am the Robert Smithson of gardening; creating images of green on the earth that evolve with each sweep of the rake. Farfetched? Perhaps. But I’m not really joking. I do like raking. And for the record Mr. Spy likes splitting wood. And who likes doing that? Gusty wind on a warm(ish) fall day: raking is pretty much the ideal activity for this sort of weather. So rake I did (while Mr. Spy split wood). I’m not really eleven feet tall, I shaped the figure by pushing the leaves with my foot. Then I felt that was cheating. But I had just showered and had wet hair so I didn’t really want to lie in the leaves. Then I figured that was a poor excuse. So I made a real leaf angel. But the puppy messed it up before I could take a photo of the real version. Wow great story! Jeez. I wasn’t going to write about raking at all today. I am writing 100 posts in 100 days, 300-1000 words each. For today’s post I was just going to think of a list of 300 words that I liked. Not necessarily the meanings but how they sound. I figured it would be an easy, quick post. However, when I got to 31 words I realized 300 is a lot. To press on I felt I would need to trawl my favorite texts (Aristotle, Shakespeare, etc.) for inspiration…which would sort of defeat the “easy, quick post” objective. Wow, great story! Jeez. Can you tell I am tiring of posting every day? Here’s the list of words. I do like the meaning of some, but they were all chosen chiefly for their sound. Syntax: Apparently what is required for me to supply 300+ (444!) words. This entry was posted in Art, Blogging, Fall, Gardening, Humor, Kids, Missouri, Parenting, Photography, postaday, St. Louis, Writing on November 16, 2013 by Spy Garden. 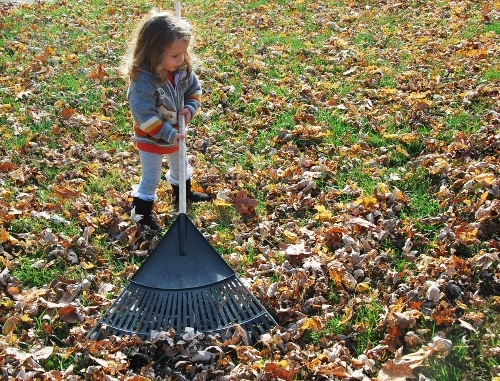 I thought my husband was the only person in the world who liked raking! 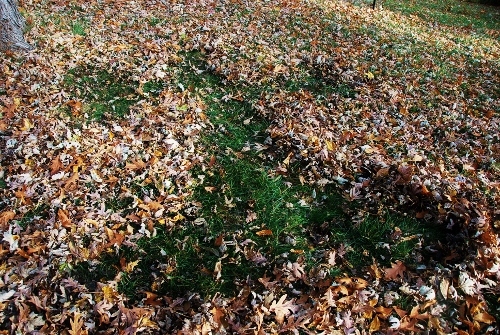 I hate raking but love push-mowing the grass – go figure. Lovely photos. Leaves were on my mind as well this weekend. Not 11 feet tall? Sigh… were their leeches? Toast is the best word in your collective of lovely words. Toast should always be followed by “butter” though otherwise it loses its unctuous smooth comforting mental status. Not entirely sure my mock-up of “syntax = sin + tax” is quite kosher but hey, any port in a storm when you are trying to be clever eh? ;). Glad this hasn’t put you off writing as you have a gift and your posts are full of interesting things. That, in and of itself, is going to get you repeat readers and followers. The rest is just so much hard work. If it isn’t fun any more, it isn’t worth it. Glad to hear you are factoring musescent happiness. They are arty and fickle and spend most of their time squabbling amongst themselves to be heard but MAN would I miss mine if they decided to go shtum! p.s. your comments are the best!!! Did the little one get to jump in the mounds of leaves after you raked? That’s such a fun kid thing to do! Not yet! 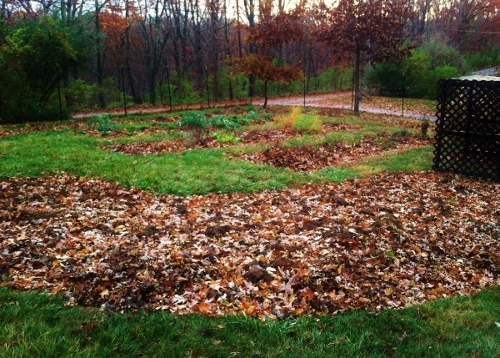 I didn’t really rake any piles, just raked the leaves in the garden (into the garden plots). 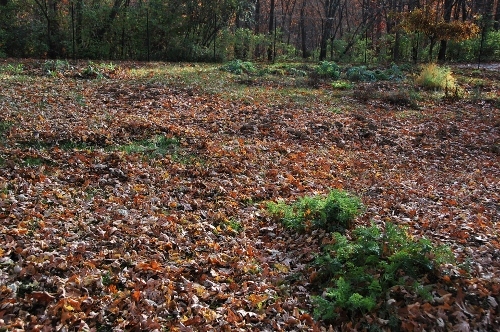 But there’s still A LOT of leaves to go in the rest of the yard. So there will definitely be jumping into piles of leaves soon!